Inventions in the world of commercial products are now becoming an inspiration for the future projects. Although the interactive display panels and touching pads are quite common, each time a similar product gets more attention from the public when it gets released. One such invention is the Interactive Mirror that can provide you with news updates scrolling on the mirror as morning headlines and a wide variety of other information while you brush your teeth. This sounds really amazing and interesting for any one. Isn’t? Not only that, but this mirror can also give you current day’s weather report, allow you to check your Gmail, watch videos and keep track of your health. It has many interesting applications like turning your reflected face on the mirror into an older one ( shows how you will look when you get older), Face recognition technology that recognizes one’s face and gives the detailed health report of that person and so on. It comes up with bright HD Led display with a pane of reflective glass. This special semi-reflective glass surface makes the users to see both the normal reflection of the real world and also the overlaid high-contrast graphics which provides the users with bunch of cool features. Features such as manipulating the displayed image, trying out new hairstyles, clothes and even trying out new make-up ranges are possible with this mirror. In addition to this, this mirror can take 360 degree photographs, so that the users can check them in every angle after trying on the new clothes. Moreover, you can even visit your favorite stores and can check the available products and directly try them on. Sometimes, customer’s personal details are stored so that it can target them with more personalized offers and can even give them few suggestions based on their preferences and on the clothes that they may have recently tried. Have you ever seen a walking house? As mentioned above, there are also other special features like face recognition technology that can call up personalized data including your health status. 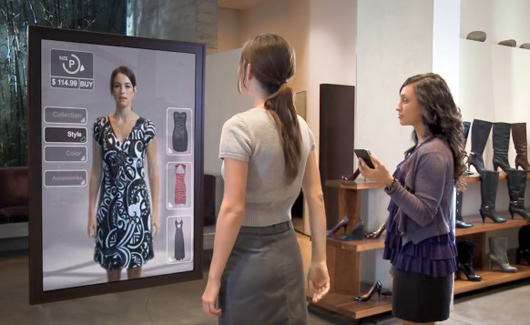 But not only this, there are also various other types of interactive mirrors that are been introduced in the market. This is a quite interesting mirror that can give you advice on anything and everything. This mirror also has a special feature like spouting random proverbs which may boost you up after a hard day. Using this mirror you can get used to the horror of ageing. This mirror is really amazing and it is much helpful for those who wish to take a glimpse into the future. This means, it shows how you will look after u get old. This mirror gives you an amazing experience of doodling on the mirror, playing with the graphics by touching and enjoying it. It will be really a good treat for the iPhone lovers. Here is the mirror which helps in receiving sms sent through a mobile phone. It is designed by the French Design Group called Radi designers. The received messages appear as a luminous text running on the mirror’s surface when one gets close to the mirror. This will be highly useful for those who love to send and receive text messages. But however, this mirror is not affordable for most of us since it cost nearly $10,000 which is really a huge amount to spend on. Above all, there is a mirror which will be very helpful in makings you a better citizen of this earth by recording daily, monthly, annual usage of water. When you start using water, light gets turned on and depth of the color depends on the amount of the water you use. Blue indicates for 24 hours, Green for 365 days and orange for 12 months. Thus on the whole, these interactive mirrors will be highly helpful for the departmental stores which allow the customers to try on the new fashions. Moreover, it can also be used as a greeting device to make the customer’s shopping more interactive. Finally, these products are almost certainly going to revolutionize the way of shopping in the upcoming Future.